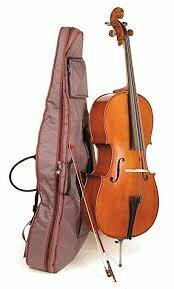 The Stentor Student II cello is the recommended student cello outfit. All Stentor cellos are carved from solid tonewoods with inlaid purfling and individually thicknessed for quality of sound. It has an ebony fingerboard and ebony pegs and is fitted with a composite tailpiece with integral adjusters (1/10 and 1/16 size have alloy tailpiece with integral adjusters). If the Conservatoire is out of range, this is an excellent choice. Featuring quality construction, components and accessories, all Stetnor Student II instruments arrive set up and ready to play.